Happy ending for the two British pilgrims missing since last Friday near the town of Valcarlos in Navarre. The pilgrims were finally rescued yesterday by members of the fire department of the town of Burguete, who were contacted by the two British seing that their situation was critical. After several days, they managed to survive with water in drinking troughs for animals scattered around the mountain. 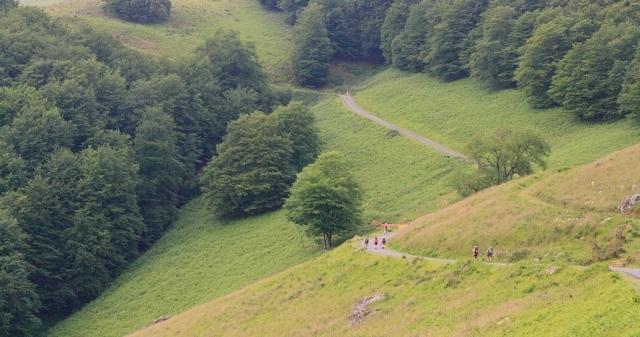 The pilgrims showed signs of starvation, dehydration and exhaustion after five days lost in a mountainous area, after missing while performing last Friday the stage of the Camino de Santiago which connects Saint Jean de Pied de Port and the Collegiate of Roncesvalles. Its location was made possible by forming a cross with brightly colored clothes that helped in the task of the fire department helicopter, which found the two pilgrims near the place. Unable to land on the rugged area with the helicopter, two firemen took down to which pilgrims were. After verifyin that they were not in bad condition, it was decided to discard the air rescue to launch it later by land, providing them water before. To finally reach them, firefighters moved in off-road, but were forced to enter the area of the pilgrims by walking to finally move them to the Collegiate of Roncesvalles. Estos ingleses... me tienta mucho poner aquello de "no estábamos ausentes, estábamos de parranda". En fin, que me alegro mucho de que se encuentren en perfectas condiciones. Historia con final feliz, esperemos que los dos se recuperen en poco tiempo.